Does anyone have a picture? And where is it located? I can do my rear diff fluid, but I don't want to touch the transfer case as I don't know ANYTHING about it, but I would still like to learn at least where it is located on the Voy, and exactly what it does. I plan on taking the truck to a trusted mechanic to do this part of our maintenance, unless of course it isn't that difficult and the hubby could do it, but I won't be going near it until I can learn more about it. 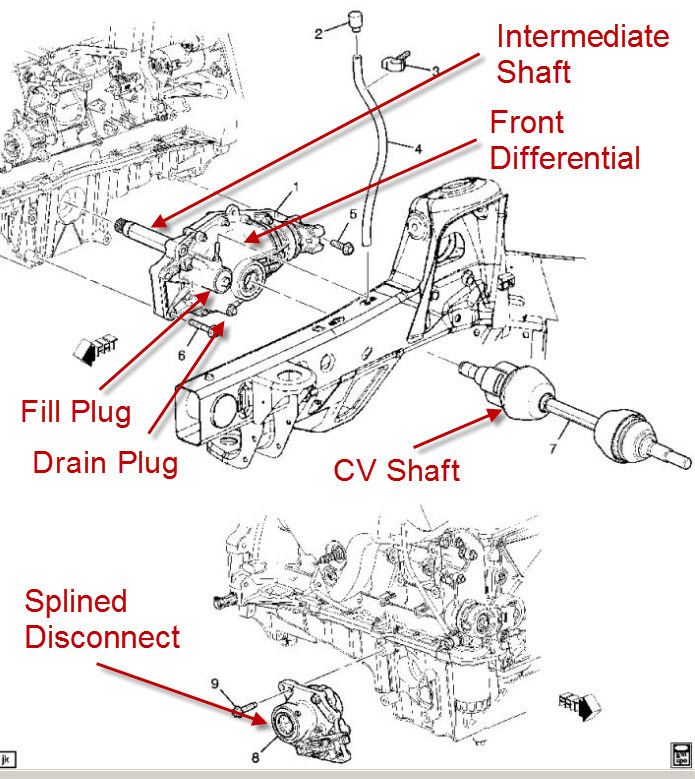 What is involved when servicing the transfer case? Drain old fluid and add more? Would I need any new gaskets(is there a gasket)? I will be pulling out my manual later on in the day, and reading up on it there as well. Also, didn't see anything in the articles/how-to. Would anyone have a video? I guess I could check youtube too. There is a front differential and a transfer case. They are two separate parts, both part of 4WD/AWD system. The transfer case is what turns your normally RWD/2WD vehicle into 4WD. It sends power to the front wheels. The differential distributes that power to the front wheels and allows for different wheel speeds, particularly in turns. Replace the fluid in both of them is easy. Both have a drain plug and a fill plug with no gaskets or filters to worry about. The front differental plugs can be accessed by removing the front driver's side wheel. They'll be "on the engine" near where the axle enters the "engine". I say "engine" because the front differential lives under/near the engine and it appears to be the same part. Loosen the fill plug (top plug) first, then remove the drain plug. Fill with synthetic 75W-90 gear lube such as Mobil 1. It should take 1-2 quarts. Fill until it overflows. The transfer case is accessed from underneath the vehicle. It is about midway beneath the vehicle, close to the center, gray, maybe twice the size of a typical box of tissues with driveshafts coming in/out of it. There are two plugs which can be removed with a 3/8" hex bit (available at any auto parts store). Remove the fill plug first, then the drain plug. Fill with GM Auto Trak II fluid only! Available at any GM dealer, should cost about $9 a quart. You'll need two quarts. Add the two quarts until it overflows. If it doesn't overflow, it's OK, it's probably the angle of the vehicle. Stick a finger in there and make sure the level is high. Getting the fluid in the transfer case can be tricky since you don't have the space to pour the bottle. I used a piece of vinyl hose, other people have used inexpensive pumps (also available at a parts store). Both jobs are very easy. If you can change your oil, you can change your front differential fluid and transfer case fluid. I'll plug MAY03LT's vids on Youtube. He explains everything nicely. I will be doing front, rear and xfer case in the next month or so. Thank you so much! I can definitely change the oil, so I should be able to save a few bucks doing all 3 myself. Just whipped this up. Should have done it years ago. Thanks Roadie!!! This will help bunches! any other thing to look for in differential fluid? I have the limited slip differential, would the same fluid front and back work, or should I look for fluid with an additive or marked for the limited slip for the back and none for the front? Remember, proper torque is essential to making any part last. How would you like it if someone over torqued your nuts? "oh, The Jedi's are going to feel this one." Not necessarily. Mobil 1 LS and Valvoline Synpower both have the additive that eliminates chatter in the rear end. The GM "grape juice" is not necessary, at least for those of us with the G80. Not sure about the SS guys. What size tube will fit in the fill hole? 3/8" outside diameter? 1/2"? My 18oz syringe tool for this purpose has a pretty big tube and I am not sure if it will fit into the fill hole. I will be getting under there this weekend but since I am 30 minutes away from the nearest parts store or lowe's I would prefer to have what I need on hand. I found the front diff easier, more room to move the bottle around, big fill hole to get the hose in, etc. I suggest (if this is the first front diff change) to heat up the fill plug before removing. It has tight, thin, threads and many become seized to the housing. I'm getting slightly confused lol I have the G80, do I still use the Mobile 1 full syn 75w90? And Autotrak II for T-case? Now I can put the mobile 1 full syn 75w90 in the front diff too correct? I just read some where that the front diff fluid is completely different weight than the rear diff....wish I could find that damn link but I just cleared out history and cookies. BLAH! No front diff and rear diff are the same fluid. The popular Mobil 1 75w90LS goes in both differentials, G80 on our trucks makes no difference here. GM actually states that only limited-slip (you have a locker, not limited slip) requires the special additive. you need 5 bottles of 75w90 to do front and rear differential fluid changes. You can use 4 if you don't spill any of the fluid. you need 3 bottles of auto-trak II (GM only) if you use a pump. You can use 2 bottles if you don't spill/waste any of the fluid. Thanks! I've got a vid coming up for the rear diffs that not only shows both versions (with and without drain plug) but also shows a much better transfer pump that is more commonly available then the one shown in the front/t-case vids. Stay tuned! I can definitely change the oil, so I should be able to save a few bucks doing all 3 myself. I will just stick to the Mobile 1 full syn 75w90 and Autotrak II. As far as not spilling any....I can't make any promises so I think I will just stick with the 8 bottles total. I'm going to try to find a pump to get the fluid in before I attempt it. The tubing I use is 5/8"OD x 1/2"ID. Any decent hardware store should have it. Ok Ok. Now guys, at my work I have mobile one gear oil and we have it by the industrial 55 gal drums. We have all kinds of weight. I know we have the 75/90. Now when telling my lovely fiance that i could get it from work, we were looking at the bottles of the mobile one 75/90 at like 13.99. She told me that if it didnt come in that bottle she didnt want it. So can somebody tell her it will be ok to get it from my work. I'm working tomorrow and I can take a pic of the label and post it for you guys to see. I just think that getting it from work and saving 90 bucks is a sweet thing to do. Until we stick it in the truck, hear grinding, and smell french fries. You will go into work and ask so and so and find out it's freaking cooking oil from damn McDonalds! As far as I know, all Mobil 1 75w90 has the "LS" Some people refer to it as either/or since on the bottom of the front sticker has the little LS in black letters. This means limited-slip. On their website they list no other kinds. Side fact: All 75w90 oil is considered synthetic. The "dino" oil equivalent is 80w90. 75w90 was not a natural oil weight until synthetics came along. In order to be less viscous all 75w90 weight oil must have synthetic properties. I can not claim however, that all 75w90's are fully (100%) synthetic. Mobil 1 does claim to be, whereas, the walmart brand 75w90 is more of a synthetic blend. I have used both. Walmart is a lot cheaper. Mobil 1 75w90 here is $11.99/Qt. Walmart 75w90 is $8.00. If you find a pump like this (Harbour Freight for a very few $) it will screw onto the bottles above and you can just pump the fluid in, no spills no mess. This pump is for putting oil in the lower end of an outboard engine, but you don't need the screw fitting on the end of the tube. This makes it easy and clean and save it when you need to do it again. So can somebody tell her it will be ok to get it from my work. I'm working tomorrow and I can take a pic of the label and post it for you guys to see. So, three (3) quarts of 75w-90 should be plenty. Buy an extra if you feel more comfortable. You can return it if you don't need it or save it for next time. It may not help many people but I found one of those style of pumps/tubing at my local Benson Auto Parts for $7.46 + tax. For comparison the ones like MAY03LT uses in his videos runs right around $30 from what I've seen in my area. If you are unfortunate and have the underbody shield package access to the transfer case drain plug is limited without removing a shield. On my 03 Envoy it's RPO ZM5. It looked to be a PIA to remove the shield so I took out the front bolts and was able to pull it down a few inches. I made a V-trough from heavy duty cardboard, let the fluid drain into it and into a catch-can. It is fine. Send me some and I will run it. I need to change my rear diff fluid anyway. If you are unfortunate and have the underbody shield package access to the transfer case drain plug is limited without removing a shield. I think you mean FORTUNATE to have one. Any protection underneath is good.